According to the Osteoporosis and Related Bone Diseases National Resource Center, a service provided by the National Institutes of Health, arthritis is a condition that impacts joints and their surrounding tissue, such as the knees, wrists, fingers, toes and hips. The two most common types are osteoarthritis and rheumatoid arthritis. Osteoarthritis is a degenerative joint disease that often develops due to the overuse of certain joints. Rheumatoid arthritis is an autoimmune inflammatory disease that occurs because the body releases enzymes that attack the lining of the joints. Both conditions are serious and have a major impact on people living in the U.S. 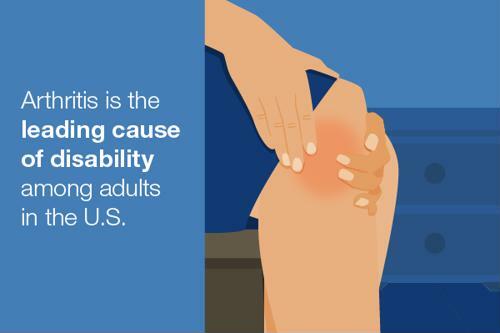 According to the Arthritis Foundation, this condition is the leading cause of disability among adults in the country. Around 54 million adults have been diagnosed with arthritis, and 300,000 babies and children have some type of rheumatic condition. About two-thirds of the adults in the U.S. who live with arthritis are between the ages 18 and 64, making a significant impact on the working world. Osteoarthritis is the most common type of the condition, and it impacts about 31 million people in the U.S.
Arthritis is more prevalent in women than men. According to the Centers for Disease Control and Prevention, adults who are overweight or obese are more likely to be diagnosed with arthritis than someone with a low body mass index. However, more than 16 percent of adults who are considered to be at a normal weight have arthritis. Between 2013 and 2015, 44 percent of adults who were diagnosed with arthritis reported that they experienced activity limitations due to their condition. Adults with arthritis are 2.5 times more likely to experience two or more falls that lead to serious injury than those without the condition. By the year 2040, more than 78 million Americans are expected to have an arthritis diagnosis. If you're currently living with arthritis or the condition has the potential to affect you, there are various options for pain management to consider now or in the future. The Arthritis Foundation recommends implementing more physical activity into your daily routine. Focus on exercises that improve posture, strength, function, and range of motion to mitigate pain and reduce its chances of occurring in the first place. A mixture of hot and cold therapy can also help reduce inflammation. Apply an ice pack to the affected area for 10 minutes, then switch to a heating pad for 10 minutes. If you're looking for an option for pain relief that doesn't keep you from going about your daily routine, the use of IMAK Compression products can benefit you greatly. Whether you choose the gloves, elbow sleeve, wrist sleeve, knee sleeve or socks, each product is designed to help reduce swelling, improve circulation and warm the affected area to provide pain relief from conditions like arthritis and fibromyalgia. Browse Brownmed's product portfolio for more information on IMAK Compression and other sought after brands today.